The first quarter of 2016 has just ended and it has flown by. We are happy to report that March was another record month for earning dividend income for the Money Sprout Index. 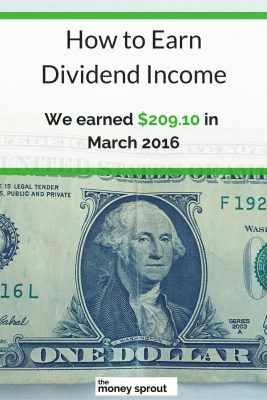 We broke the $200 threshold for the first time ever for March dividend income. I absolutely love looking back at our March dividends from past years to see just how far we have come. Just 3 short years ago we were not even earning $100 in dividends per month and look at us now. We saw an increase of over 24% last month compared to March 2015! We had our normal automatic investments in WalMart, Verizon, Unilever, Microsoft, Dr Pepper Snapple, Kellogg, Coca-Cola, and Kraft Heinz through LOYAL3 and Computershare. We also used some dividend balance to add a share of Omega Healthcare and a share of Emerson Electric. 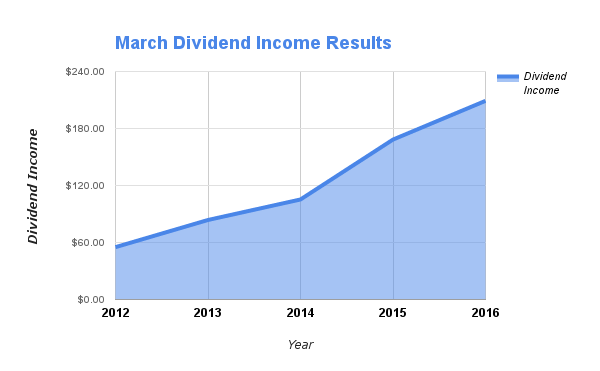 The dividend income earned in March ($209.10) was up over 24% from the same time last year. This is all a direct result of pumping more and more money into the stock market. March always has been one of the busiest months for earning dividend income, and this past month did not disappoint. Our goal for the remainder of 2016 is to invest as much new money as we can to dividend stocks. This is a necessary step if we plan to hit our 2016 goal of earning $2,250 in dividend income. 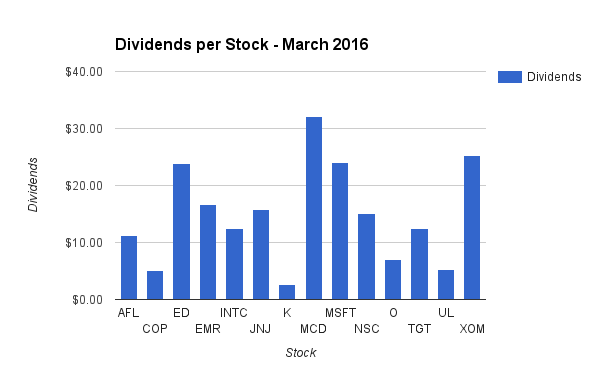 How was your dividend income in March? Full Disclosure – At the time of this writing, we owned shares in the following stocks noted in this post – AFL, COP, DPS, ED, EMR, INTC, JNJ, K, KO, KHC, MCD, MSFT, NSC, O, OHI, TGT, UL, VZ, WMT, and XOM. The material above is not a recommendation to buy. Please do your own research on a company before deciding to invest.